In just a little more than two months the Cleveland Cavaliers will open a first-round playoff series as the team tries to win the first NBA title in franchise history. It’s been a forgone conclusion that the Cavs will make the playoffs this season ever since signing LeBron James in free agency and trading for Kevin Love. But even though everyone has expected the Cavs to be in the playoffs, it will still be nice to see the club return to the post-season after a four-year absence. This spring will also mark the anniversary of another Cavs playoff team, one that to this day remains the most unexpected playoff team that Cavs fans have ever seen. The 1984-85 Cavs came out of the darkness of the Ted Stepien era, a four-year stretch that came as close to killing basketball in this town as we’ve ever seen. Under Stepien, the Cavs were 66-180, went through five different head coaches, and saw attendance at the Coliseum drop to around 6,200 a game (although it was far, far less on most nights). The season tipped off on Oct. 26 in Philadelphia, a 111-101 loss to the 76ers, and wouldn’t end until almost six months later in the playoffs against the Boston Celtics. What happened in between, no one saw coming. That opening-night loss to Philadelphia was the beginning of a 2-19 start to the season as Karl clashed with his star player, World B. Free, a shooting guard in every sense of the world, and the team’s top draft pick, center Mel Turpin. Karl eventually came to the realization that he had to adapt his strategy to fit his players, not the other way around, and came to a truce with Free, who easily led the team in scoring with 22.5 points per game. The team also benefitted from the return of Lonnie Shelton to the lineup. The veteran Shelton, who had been sidelined with a knee injury during the horrible start to the season, combined with Mark West to give the Cavs a physical presence along the front line – something they sorely needed with the pillow-soft Turpin in the middle. Once everyone settled into their roles, the Cavs closed out the season by winning 34 of their final 61 games, clinching the team’s first playoff appearance in seven years in a win over New Jersey on April 9. The reward? A first-round series with the defending champion, 63-win Boston Celtics. These were the Boston Celtics of Larry Bird, Robert Parish, Kevin McHale and Dennis Johnson, a team that had just posted its sixth season (out of the past seven) of at least 60 wins. (It is important to note, however, that while the Celtics won three titles in the 1980s, two of them came against over-rated Houston teams. The Lakers won five titles in the decade, including two over the Celtics. So remember that the next time someone tries to sell you on the Celtics being the team of the 1980s). The Cavs dropped the first two games in Boston Garden by a combined five points, missing 10 free throws in Game 1 and five more in Game 2. The team’s problems at the free-throw line haunt us to this day, as the Cavs made just 76 percent of their free throws during the series (the Celtics were at 86 percent), a key stat in a series that saw the two teams wind up even on cumulative points. In the opening game, the Free missed a three-pointer at the buzzer that would have given the Cavs the win. In Game 2, the Cavs came back from a 13-point third-quarter deficit to once again just fall short at the end. Down 2-0 in the best-of-five series, the Cavs came home looking to break a 17-game losing streak to the Celtics and to a sold-out Coliseum crowd aching for something to cheer about. Free and the Cavs were at their best in front of the home crowd, with Free scoring 32 points and handing out eight assists, while Roy Hinson added 21 points and nine rebounds. The 105-98 Cavs win (ranked as the No. 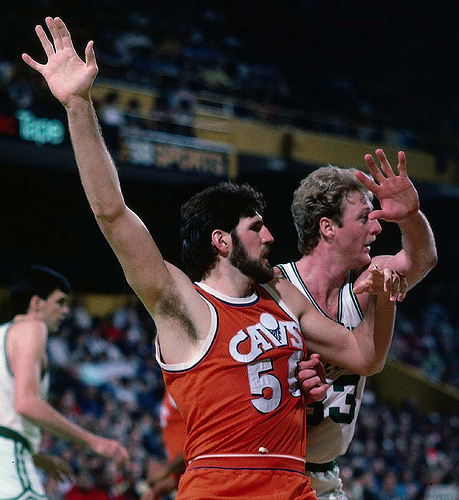 15 game all-time in Jonathan Knight’s book, Classic Cavs: The 50 Greatest Games in Cleveland Cavaliers History, entertained the home crowd a little too much. Bird, to put in mildly, was not pleased. Bird was true to his word, scoring 34 points, grabbing 14 rebounds and handing out seven assists. Despite all that, the Cavs has a 66-63 lead at the half, and with a little over four minutes remaining in the game led by five points. But Bird scored six of the Celtics final eight points and, despite another 30-point performance from Free, the Cavs lost and the unexpected playoff appearance was over. We like Weltman’s enthusiasm but, no, the Cavs were not the NBA championship. The Cavs were not able to repeat their success the following season, firing Karl with 15 games left (and after learning he was talking with the University of Pittsburgh about taking over the Panthers) in what would become a 29-53 season. Weltman also out-thought himself on draft day, passing up Karl Malone in the first round so the Cavs could select Charles Oakley, only to then trade Oakley to Chicago for Keith Lee. Malone would go on to a Hall of Fame career with Utah, Oakley would be a mainstay with Chicago and New York (among other teams) for 19 seasons, while Lee would be out of the NBA after just 182 games and three seasons. Less than a month after he fired Karl, Weltman himself was shown the door as the Gunds turned the team over to general manager Wayne Embry and head coach Lenny Wilkens, a duo that over the next seven years would oversee the first golden era of Cavs basketball. George Karl was hired last week as coach of the Sacramento Kings. The job will be Karl’s fifth stop since being fired by the Cavs, having coached Golden State, Seattle, Milwaukee and Denver. His record as an NBA coach is 1,131-756 in the regular season and 80-105 in the playoffs. Harry Weltman passed away on May 8, 2014. Following his time in Cleveland, Weltman was general manager of the New Jersey Nets from 1987-90. In 2013, Weltman was inducted into the Greater Cleveland Sports Hall of Fame, and he is also a member of the Baldwin-Wallace Alumni Athletic Association Hall of Fame. 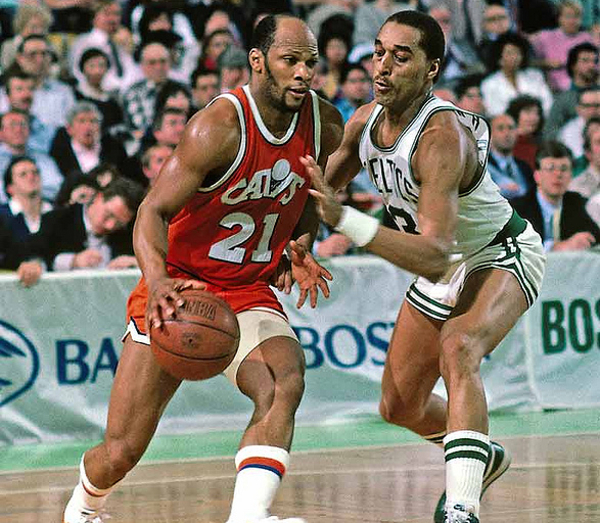 World B. Free’s final season in Cleveland was 1985-86. In three-and-a-half seasons with the Cavs, he averaged 23 points a game and was, on many nights, the only reason to watch the team play. After playing two more seasons, Free retired and now works with the Philadelphia 76ers, making more than 150 community appearances each year to teach the fundamentals of basketball and provide life lessons to children in the Philadelphia area. Roy Hinson played three seasons with the Cavs before being traded to Philadelphia in exchange for the No. 1 overall selection in the 1986 NBA Draft, a pick the Cavs used to select Brad Daugherty. Hinson would play nine seasons overall. Today he is a regional representative with the NBA Players Association, responsible for administering the association’s financial education program. Phil Hubbard spent eight seasons with the Cavs, retiring after the 1988-89 season. He is currently head coach of the Los Angeles D-Fenders in the NBA’s Developmental League. Prior to that, he spent 12 seasons in the NBA as an assistant coach with the Atlanta Hawks (1995-98), Golden State Warriors (1998-2003) and Washington Wizards (2003-09). Hubbard also worked as a college scout for the New York Knicks (1990-95). He also coached in China and Dominican Republic, leading Caneros de la Romana, of the Dominican LNB, to the Division Championship in 2012 as the team’s head coach. The 1984-85 season was the last of Lonnie Shelton’s 10-year NBA career. He spent three seasons with the Cavs, averaging 12.6 points and 7.1 rebounds per game. 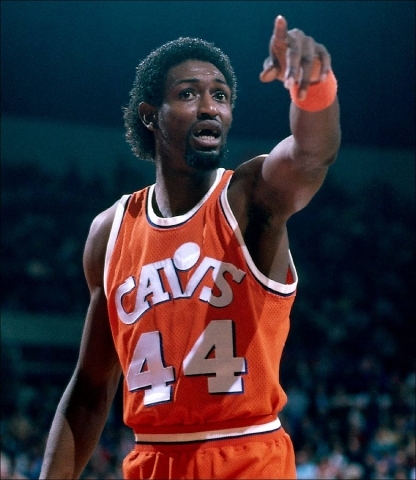 John Bagley played 13 seasons in the NBA, five of them with the Cavs. A member of the Boston College Varsity Club Athletic Hall of Fame, he has held several positions since retiring from the NBA in 1994, including head basketball coach at Harper College in addition to running developmental programs for kids. Ben Poquette played four seasons in Cleveland during his 11-year NBA career. He was traded to Chicago during the 1986-87 season and retired from the NBA after that season. He continued his career in Italy before retiring in 1990. A member of the East Lansing High School Hall of Fame, Poquette is currently a pharmacy manager with Forest Hill Foods in Michigan. The 1984-85 season was the first in Cleveland for Johnny Davis, who was traded to Atlanta during the midway point of the following season and then retired after playing in 27 games for the Hawks. After retiring as a player, worked in the front office with Atlanta for three years, before joining the coaching ranks. Over the years has worked with the Los Angeles Clippers, Portland Trailblazers, Philadelphia 76ers, New Jersey Nets, Orlando Magic, Minnesota Timber Wolves, Indiana Pacers, Memphis Grizzlies, Toronto Raptors and the Los Angeles Lakers. The sixth-overall selection in the 1984 NBA Draft, Mel Turpin played just five seasons in the NBA, spending his first three years with the Cavs, where he averaged 10.4 points and 5.4 rebounds per game. He took his own life in July of 2014. Mark West is currently an assistant coach with the Phoenix Suns. After a 17-year NBA career, West joined the Suns’ front office as assistant general manager in 2001. He spent seven years as the club’s vice-president of player programs before joining head coach Jeff Hornacek’s staff for the start of the 2013-14 season. The Cavs were the final stop on Edgar Jones’ eight-year, four-team NBA career. Jones spent just a season-and-a-half in Cleveland, averaging 9.2 points and four rebounds in 79 regular-season games. His jersey is the only one that hangs in the rafters of the Lawlor Events Center at the University of Nevada-Reno, where he still ranks in the top five in points per game, rebounds per game and blocks per game. We also owe Ben Cox a tip of the hat, as it was his random Tweet showing an illustration of the 1985 Cavs that got us thinking about this very unexpected playoff team.